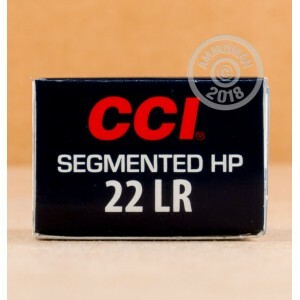 This .22 LR ammunition from CCI is a fearsome varmint-killing load firing a 32 grain copper plated segmented hollow point bullet. Upon contact with the target, the bullet fragments into three pieces to inflict massive damage. A muzzle velocity of 1,640 feet per second produces flatter than usual trajectories for this caliber and enhances the round's effective range. Formerly sold under the Quick-Shock brand, segmented hollow points have long been a favorite of varmint hunters due to their extreme efficiency against squirrels, groundhogs, and other small pest animals. 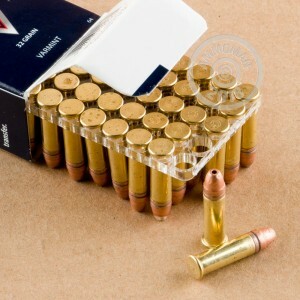 They are loaded in Lewiston, Idaho and use rimfire-primed brass cases. Check out the rest of AmmoMan.com's selection or pick up a couple of these bricks to quality for free shipping from AmmoMan.com!